Last night my family attended one of my favorite events of the Christmas season, actually the entire year. Our church held its Round The Table Carol Sing. Every year the church has a potluck dinner, and then we sing carols while enjoying cookies and wassail. The youth of the church also display their talents through telling the Christmas story, maybe a skit or two, and various musical performances. Everyone brings candles to set on their tables, and it is a really nice evening of fellowship. It brings me back to the potluck dinners of my youth. We had a lot more than our church has. Of course, I was a child and it seemed like we had them once a month, but I think it was more like 3 or 4 times a year. I loved to peruse the table and see the variety of dishes. It always amazed me how the church ladies could make so many different kinds of Jello molds! My kids don’t really care too much for Jello, but as kids my brother and I loved it. I am always pleasantly surprised at the good mix of different foods. It just seems to perfectly work out. Every time we attend a potluck event and I need to bring a side dish, I always seem take my creamy corn casserole. It is popular with kids and easy to make. My family loves to make fun of me that this is the dish I always take when I make so many different things. Hey, I like to do what works. Can you blame me? 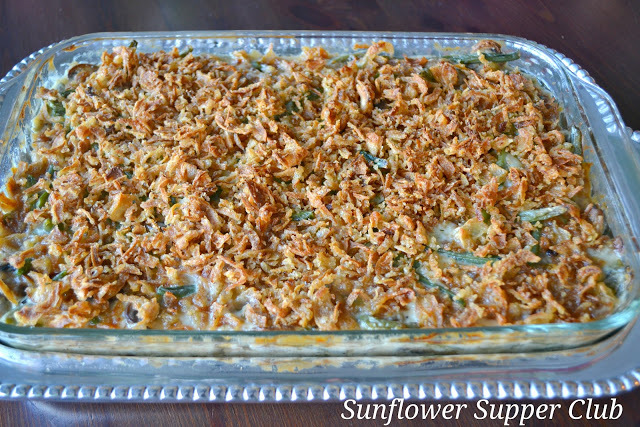 This time I thought I would change it up and share my version of an updated Green Bean Casserole. I thought it would be the perfect time to share it with Christmas now less than a week away! I have been perfecting this to my family’s taste for several years, and we really enjoy it. Even the mushroom haters in my family can deal with it. I never really gave much thought to the traditional Green Bean Casserole that was popular when I was growing up. I remember it to be bland and mushy and not really worth eating. The onions on top were definitely the best part. Also, as I have said before, I’m not really big on canned soups. In fact, Julie and I rarely use a canned soup. It really doesn’t take much longer to make your own white sauce to use in your recipe, and it just has a fresher taste. Cook beans in large pot of salted boiling water. Cook 4 to 5 minutes until fork tender. Drain and rinse with cold water. Drain well and transfer to a large mixing bowl. 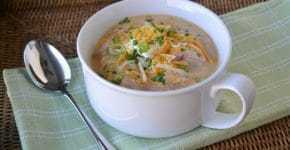 Melt 3 tablespoons butter in large skillet over medium heat, add chopped onion and mushrooms. Season mushrooms and onion with 1 teaspoon salt, ½ teaspoon pepper, and 2 teaspoons dried thyme. Cook over medium heat until mushrooms release their liquid and there is only about 2 tablespoons liquid left in the skillet. Add the teaspoon of minced garlic and cook about 1 minute until fragrant. Transfer to the large mixing bowl and mix with the cooked beans. In the same skillet melt the remaining 3 tablespoons of butter over medium heat, add flour. Stir constantly and cook for about 1 minute. Slowly pour in milk and bring to a simmer over medium heat. Let simmer about 5 minutes until thickened, whisk frequently to keep from scorching. Add ¼ teaspoon of nutmeg and season to taste with salt & pepper. I used ¾ teaspoon kosher salt and ½ teaspoon pepper. Remove from heat and let cool. Pour cooled sauce over bean mixture and stir to coat. Add 2 cups Swiss cheese and stir to blend. Spoon into a greased 3 quart baking dish. Bake at 350 degrees for 40 minutes until sauce is bubbly. Top with French’s Onions and cook about 5-10 more minutes. Cook's Note: If the fresh green beans don't look that fresh I have had great results with frozen. Dillon's Private Selection has a petite frozen whole green bean. Sam's Club also had a really nice frozen bean. The Private Selection beans you can steam in the bag. I just put them in for a little less time than the package direction because they will continue cooking in the oven and you don't want mushy beans. I wouldn't recommend getting the thick cut green beans. Thanks for sharing your great recipes at Snickerdoodle Sunday. Pinned and Tweeted. We appreciate you linking up each week!